1. Letting Isaiah Thomas bolt for Phoenix without a fight, and replacing him with Darren Collison, an older and demonstrably worse player earning just $1.4 million less than Thomas on average over the next three seasons. 2. Renewing their flirtatious pursuit of Josh Smith, who just wrapped one of the most dispiriting individual seasons in recent league history. Smith is due $13.5 million in each of the next three seasons and has approximately zero trade value. Even the most open-minded NBA folks were baffled. Those choices capped a tumultuous 15-month period that included an ownership change, the end of the murderous Maloof reign, agreement on a new arena deal, the hiring of both a new coach and a general manager, and an endless flurry of moves that turned over nearly the entire roster and left only murky evidence of any coherent team-building approach. Verbal Kint would struggle to weave a narrative from Sacramento’s collage of transactions. They acted at times like a rebuilding team determined to keep its cap sheet clean. Sacramento smartly passed on a pricey contract for Tyreke Evans, dealing him to New Orleans in a sign-and-trade that returned Greivis Vasquez — an elusive (for the Kings) pass-first point guard who earned about $9.5 million less last season than Evans did. They pawned off the last two seasons of Marcus Thornton’s deal on the desperate Nets, receiving Jason Terry’s cheaper contract in exchange. But over the same period, the Kings flipped roles to the part of a hungry “win now” team willing to spend big on veteran players. They filled the cap space that Evans left behind by committing nearly $11 million last season combined to Carl Landry and Luc Richard Mbah a Moute, good soldiers who jumbled a frontcourt that was already overcrowded. They promptly sent Mbah a Moute to Minnesota for Derrick Williams, the sort of risk-free trade for a once-promising young player any rebuilding team should make — even if the deal added a bit of salary. That kind of ambiguity is not a sin in itself. Lots of teams have straddled two team-building strategies at once, with the post–Yao Ming/Tracy McGrady Rockets managing to simultaneously rebuild and remain competitive. But those Rockets had proven NBA players, strong ownership, and a smart general manager pushing the boundaries of league rules. The Kings? They haven’t hit .500 since 2005-06, their ownership situation was one of the worst in pro sports before Vivek Ranadivé rescued them, and their current GM, Pete D’Alessandro, came aboard last June only after the team had hired a new coach and made several crucial free-agency decisions. Being bad has at least supplied the Kings with lottery picks in Ben McLemore and Nik Stauskas as they work the tricky transition from doormat to “win-now” hopefuls. But the presence of those players symbolizes just how hard this is going to be. The Kings want to shift from 28-win lottery fodder to playoff contenders in just two years, and in a Western Conference so loaded, it took 49 wins just to snag the no. 8 seed last season. Good freaking luck. 1. Give up nothing of long-term value in searching out available veterans. Sacramento traded four backup players for Gay. That they haven’t yet acquired Smith suggests that the Kings are holding firm on offers that include only players in which they have little long-term interest — guys like Williams, Landry, and Jason Thompson. If Detroit demands McLemore, Stauskas, or a future pick, the Kings will hang up the phone. 2. They are willing to take on good players with bad long-term contracts. That is something you won’t hear many GMs admit, and it might end in disaster. But Sacramento has little history of drawing top-level free agents, meaning the Kings must use the trade market to nab big-name veterans. And Smith, like Gay before him, is a good player whose skills get lost amid all the screaming over his pricey contract. A player can, in fact, be good and overpaid at once. The Pistons shoehorned Smith into playing small forward last season, and to the surprise of no one, Smith responded by launching horrid jumpers and struggling to chase quicker wing guys on defense. Slot him back at power forward, and you have a plus passer who can lead the break and provide some rim protection next to DeMarcus Cousins. Playing fast is part of Ranadivé’s vision for “positionless basketball.” The Kings want to run with guys who can fill multiple positions and execute lots of things from lots of different spots on the floor. Gay can slide to power forward in small-ball lineups and shooting guard in ultra-big groups, and he can lead the break if he snares a rebound. Cousins loves to bring the ball up, and he can do damage in the half court passing from the elbow or smashing into dudes at the rim. Stauskas can handle the ball, and McLemore, should he improve, can play either wing position. It sounds wonderful: keep your young guys and draft picks, work the trade market for the right veterans, and run-and-dunk your way to 45 wins in two years. Sacramento fans would be fired up about that, and even the “old guys” leading the way in this scenario — Gay and Smith, or some similar veteran — are still in their primes. This doesn’t account for opportunity cost, nor for the puzzling choice of Collison over Thomas. The Kings after passing on Evans could have gathered between $10 million and $20 million of cap space into each of the last two offseasons,3 and carried a lot of that space over into the actual NBA season. Cap space has never scored a basket, but it is a very useful roster-building tool. The Jazz, Lakers, Celtics, Cavaliers, and others have used it to snag first-round picks as the price of acting as a dumping ground for unwanted salary, with the Lakers’ trade for Jeremy Lin and a Houston first-rounder being the most recent such predatory move. Even teams in non-glamour markets can use cap space to lure second-tier free agents who become either productive players or trade chips — or both. The whole league would love to have Paul Millsap on a two-year, $20 million deal, and in just a few months we might look at Charlotte’s three-year, $27 million deal for Lance Stephenson as one of the league’s great bargains. Free agency between maximum and minimum contracts generally produces the worst return on investment, but smart teams, even those outside destination markets, can find some gems. Cap space can have other uses, but the Kings have spent so much money in the last 16 months that swapping Thomas for Collison merely spared them from going over the luxury tax. A lottery team paying that much is rare outside of New York. And that’s the danger here: Sacramento could do pretty well at this “win now” course and peak with an expensive team that still isn’t good enough to crack the top eight in the West. The Kings will trumpet the fact that they could have max-level cap room a year from now — that all of this spending has done nothing to their future flexibility. But they vaporized their flexibility over the summers of 2013 and 2014, and they will do so again if they re-sign Gay at a big number or trade for another expensive veteran on a multiyear contract. If their roster peaks as so-so in 2017, the Kings might have to veer back into rebuilding mode three or four years after they could have started the process properly around Cousins. And if the Kings wanted to invest in veterans whom the rest of the league considered overpaid, they could have simply kept Evans — a younger player they knew well. Getting Thomas at Jodie Meeks money would seem to be something any team at any stage would want, but the Kings opted for Collison instead. Sacramento’s choice appears to have come down to Collison’s allegedly superior defense, particularly his ability to press full-court, and his willingness to accept a lesser role in the offense. The Kings’ defense has been a catastrophe for a half-decade, and it ranked just 23rd in points allowed per possession last year under Mike Malone. Thomas is feisty and deceptively strong, but any player listed at 5-foot-9 is going to be a liability. He showed only so-so commitment to staying in a defensive stance, sometimes standing straight up instead of priming himself in a crouch, and he too often ran smack into picks. And he does shoot and dribble a lot, a shaky fit on a team that has two other guys in Gay and Cousins who much enjoy doing both of those things. Thomas worked hard on his passing last season, but he still jacked nearly 16 shots per 36 minutes, more than Chris Paul (a prototype point guard) has ever attempted in a season. Only 11 guys attempted more pull-up jumpers per game last season, per NBA.com, and Thomas shot a paltry 31.8 percent on pull-up 3s — 42nd among 69 players who attempted at least one pull-up triple per game. Thomas is a pick-and-roll scorer at heart. He’ll go over one pick, probe the defense, bring the ball back out, and ask for another pick. This has visibly annoyed Cousins at times. Thomas dribbled the ball 496 times per 36 minutes, the fourth-largest number among all guards who logged at least 25 minutes per game, according to an analysis of SportVU visual-tracking data provided exclusively to Grantland. Thomas took an average of 5.7 dribbles every time he touched the ball, the second-highest number among all qualifying guards, trailing only D.J. Augustin, per the STATS LLC analysis. Collison bounced it an average of only 3.9 times per touch and averaged nearly 200 fewer dribbles per 36 minutes, though playing a ton alongside Paul depressed those numbers. Here’s the thing: Thomas is actually, you know, good at scoring! He’s a wizard at getting into the lane, and at using hesitation dribbles and canny fakes to create space for scoop shots. He has long been one of the league’s best finishers at the basket, a remarkable thing considering how short he is, and he has a refined midrange game. Thomas loves to take little floaters on the run, and he hit 42.2 percent of his shots from the portion of the paint outside the restricted area, per NBA.com — 24th among 97 guards who attempted at least 50 shots from that range. He’s an above-average midrange shooter, and he nailed 48 percent of his pull-up 2-point jumpers per NBA.com — a sizzling number. Thomas could stand to pass more. His habit of asking for second and third picks bogged things down at times; Sacramento did not have much of a secondary offense, where the ball would swing from one side to the other in a continuous sequence of options. But part of that is on the coaching staff. Thomas takes a couple of jumpers each night that you’d like to have back, and it’s tough for a 5-foot-9 guard to fling skip passes to the opposite corner on the pick-and-roll. But he dished more dimes and recorded assists on a higher percentage of teammate baskets than Collison has in any season since his rookie year. Thomas and his teammates grew more familiar with each other as last season went on; the Kings’ bigs seemed to have a better sense of how to synchronize their cuts with all of Thomas’s funky fakes and in-and-out dribbles. They could have grown more together. Collison has never been Thomas’s equal as a scorer or a passer. He’s hesitant about penetrating the defense in the half court, and his inability to read the floor has frustrated coaches at just about every stop. Ask the Mavericks about him sometime. Collison is a speed demon, but the Kings ranked about average in pace last season, and — get this — they played much faster with Thomas on the floor. The guy might pound the ball in the half court, but he loves to run, and he’s always calling for the ball, body already leaning toward the other team’s basket, when the Kings grab a defensive rebound. The Kings were at their best overall, period, with Thomas on the floor. They shot more 3s, earned more free throws, and actually outscored their opponents in Thomas’s minutes — heady stuff for a team that finished 13th in the West. They were a .500 team when all three of Thomas, Gay, and Cousins were available, and they just let one of those three guys walk. The Kings say they have numbers showing they will be better off with Collison in Thomas’s place. It’s just unclear what those numbers are, or what exactly they say, and the Kings justifiably won’t share their private stash. Some of their confidence likely stems from Gay’s strong play in Sacto, and especially from Gay shooting 56 percent on post-ups as a King, per Synergy Sports — a huge jump from his numbers in Toronto, and a reminder that Gay was once a feared post player. Gay can overpower smaller defenders, but he’s not the sort of scorer who catches and goes in a flash. He likes to hold the ball, survey the defense, and take his time at work. That eats up the shot clock and makes for an awkward match with Thomas. Gay’s shot distribution didn’t change all that much in Sacramento, though he did trade some isolations for pick-and-rolls and post-ups. But he mostly made a ton of tough buckets. If the Kings are counting on that to continue, they may be disappointed. Sacramento might have the benefit of better spacing next season, thanks to Stauskas and (hopefully) some improvement from McLemore. More roster continuity should also help. But they’d have had all that on offense with Thomas, and there’s very little evidence that Collison is a better defender. He’s probably worse on balance. Collison is taller than Thomas, but he’s still undersize, and he has had unending trouble navigating screens on the ball. Toss Collison into a pick-and-roll, and he’s liable to drift 10 feet under the pick, damn near vanishing from the play before scrambling to find his bearings. Basketball people disagree often, and let’s just say that a lot of people around the league disagree with choosing Collison over Thomas. Collison has certainly had his moments, including as a transition force for the Clippers in the playoffs last season, and he may well thrive in a new context. Defense is where the rubber will meet the road for Sacramento. We can focus on the point guard spot and all these transactions, but the Kings, at bottom, have been terrible for so long because they can’t defend. Malone is a defense-first coach, and all the roster changes made it hard for the Kings to digest and implement his system. 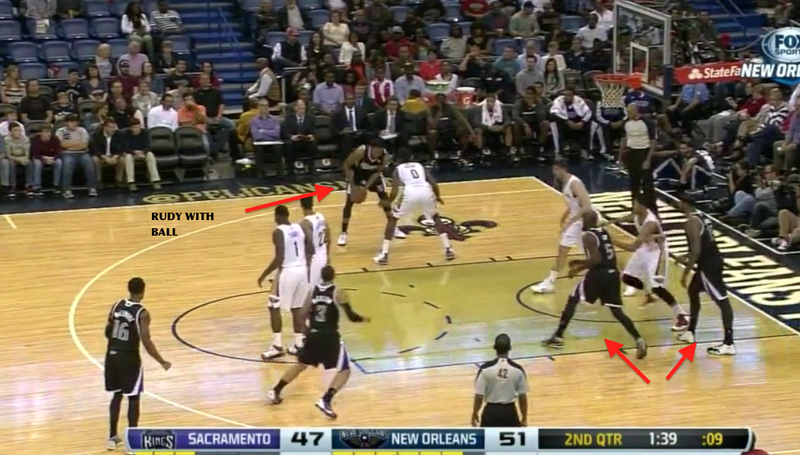 Malone installed a pretty standard NBA defense in which his big men dropped back to contain opponent pick-and-rolls. With two Kings containing the ball handler, one guy would slide in from the weak side, bump the big man rolling to the rim, and prevent an easy pass to that player. It was pretty standard NBA stuff; the Kings just couldn’t execute it well. Both Thomas and Ray McCallum got smothered in picks, forcing the Sacto big men to help more dramatically on opposing ball handlers, triggering fatal extra help rotations all over the floor. None of this was surprising, given the team’s youth and the constant roster churn. Rookies struggle on defense, and McLemore predictably wasn’t ready for NBA-level help-and-recover stuff. Travis Outlaw should never be allowed to defend wing players, and he only had to do so after trades left huge holes in Sacramento’s roster. Defensive chemistry — knowing where to go, and when, depending on which teammates are on the floor — is a real thing that requires lots of time to marinate. The Kings were bound to be bad defensively last season. This season is a big year in that regard. The quickest way to become competitive is to cobble together a league-average defense. It’s hard to manufacture such a defense on this roster, but the Kings are out to prove all the naysayers wrong. Their long-suffering fans deserve it. Adrian Wojnarowski of Yahoo reported on Monday that the Kings-Pistons trade talks had stalled, and that Stan Van Gundy had told Smith to expect to be a Piston when training camps open. But the talks were serious and could revive anytime. To be clear, D’Alessandro wouldn’t discuss Smith, since trade talks are confidential. It could have been more or less, since extrapolating counterfactual scenarios is dicey. But they could have had a bundle of space in both summers had things gone differently. The same is true for Collison and Blake Griffin. The way Griffin pushed last season, I had thought perhaps the Clips’ numbers jumped when Collison and Griffin shared the floor. Nope.